Each month we will provide a story written by either one of the horses at the feedlot or one that has already been adopted. Hi, my name is Smoke. That is what my foster mom named me. Please let me tell you a little about myself. 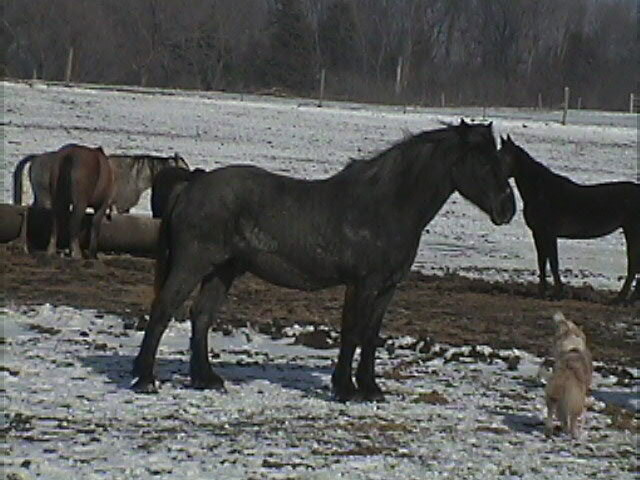 I am a 10 year old blue roan Percheron gelding. I was born out west I believe Wyoming, and have lived most of my life there. I have spent most of my life pulling wagons and carts. There were once two of us. We were in many parades. We traveled across the country in wagon trains. I remember many children patting us and saying many kind words. Oh yes life was perfect, we were loved, cared for and always well groomed. Then one day the unbelievable happened. We were at home in our pasture. A bad storm was coming. We didnt think much of it, we have lived through many storms in our lives. We went on with our lives as usual. Thats when it happened. My team mate and good friend got struck by lightning. I couldnt believe it, I was shocked and saddened by my sudden loss. My owner was shocked with disbelief. He promised me nothing would change that he would find me another partner. As the days went by my hopes were diminishing and as my fears became reality. My owner came out to the pasture put my halter on and led me away. I was told that he had no luck finding me a partner, that blue roan Percherons were too rare and he couldnt drive me with any other color horse, it wouldnt look right. I was sold. When I arrived at my new home I was informed that this is was not where I wanted to be. There were many horses at this new place and none of them looked very happy. This, however, was my luck day. On this day a lady was there and she saw me. I stick out like a sore thumb with my rare color. A few days went by and I saw that same lady again. Today she was here to see me. This is what she told me later: When she left the feedlot the first day I saw she was picking up two shires, a mom and her baby. She called the same lady that saved them and asked her if she would be interested in a blue roan Percheron. Roby is my new moms name. I will soon be on my way to my new home in Wisconsin where I hope to live out the rest of my life being loved.